Four suspects have been arrested for allegedly swindling members of the public of various sums of money. The four suspects were picked up separately by the operatives of the Rapid Response Squad (RRS) of Lagos State police Command . The suspects, Kenneth Umukoro, 36; Uba Utokcha, 41; Joseph Onuoha, 40 and Ikechukwu Okeke, 25, individually confessed to RRS officers during interrogation. According to one of the victims, Ibeh Chiwenu, she was going to Ojodu Berger from Ojota when Kenneth Umukoro, driving a ash colour Toyota Camry 1997 model with the registration number SMK 886 DK stopped at the bus stop to pick her. “As he drove along, he picked another passenger on Kudirat Abiola Way. We were still on Kudirat Abiola Way when the new passenger started a conversation in something like French language with the driver”,The driver now pleaded that he wanted to take the new passenger to Custom’s Office on Mobolaji Bank Anthony Way, where his goods were seized. It was here that their story changed and I became the subject of their manipulation in connivance with a custom agent and a pastor”. Under the pretext that the four of us assist the man whose goods were trapped with the custom over export duties, they brainwashed me into releasing my ATM card, led me to withdraw the last N9,000 from my account. After this, the pastor prayed for me and told me to go home and get more money my family kept at home. “All these happened last week. On Thursday, my husband and I were standing at the Maryland Bus Stop. I saw the same Toyota Camry with the same number plate and a new driver, but beside it was the former driver that lured me into fraud, pretending to be passenger. I alerted RRS officers stationed in Maryland and they arrested them”. 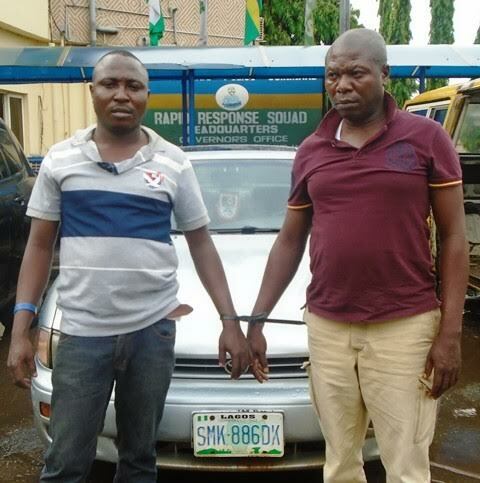 The two other suspects, Joseph Onuoha and Ikechukwu Okeke were arrested separately but in similar circumstances on Tuesday and Wednesday respectively. Onuaha, disclosed to interrogators that he belonged to a fraud syndicate led by one man simply identified as Toronto, adding that their leader, who is now at large, trained over 40 of them to go out daily in search of would-be victims. “When we hit jackpot, we share it into five parts. Toronto takes two parts. Two of us in a team share two and we would share the remaining part to others. Presently, our office in Ajegunle has been busted by the police. Toronto as I was told has relocated to somewhere in Surulere. Whenever we have issues with the police, he comes around to secure our bail”, he disclosed. The four suspects have been transferred to the State Criminal Investigation Department (SCID), Panti.